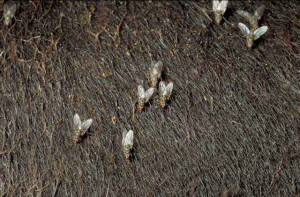 One of the things beef producers dread most about the coming warm weather is the advent of troublesome horn flies. These insects are annoying, to be sure. But, they are more than just pests, they are really “obligate parasites,” who must stay with –and live off of- their host in order to survive. They feed on cattle by cutting through the skin and sucking blood. This is not only painful and distressing for the animal, but also has a direct impact on body condition, and consequently, on the producer’s bottom line. As a result, Boutilier says, an estimated $800 million are lost each year to horn flies. The gold standard in controlling these pests is S-Methoprene, the generic name for Altosid® IGR, which is registered to a subsidiary of CLS. The product, originally developed in the late 1960’s for mosquito control, was registered by the EPA in 1975 as a cattle feed-through product. Incorporated into cattle feed, Altosid passes through the animals without affecting them, remaining in manure to control horn flies. It does this by mimicking a juvenile fly hormone that inhibits fly larvae from maturing. In fact, the EPA has determined that the use of methoprene is exempt from tolerance. And, insects have not developed a resistance to Altosid, unlike many other insect control products that kill the adult. As a result, CLS has created a variety of formulations, all very specific to their intended uses. In the cattle market, for instance, they created a formula that will pass through and remain in manure. The dosage is low enough that it affects horn flies, but doesn’t inhibit dung beetles’ ability to break down manure. The dosage is typically about 1.1 mg per hundredweight of animal, per day. Boutilier described the work Purina has done on consumption and intake management as “elegant”. It’s a method they use in their Wind and Rain® Fly Control Mineral tubs, in which Altosid is incorporated. Through taste and physical properties, the method actually controls how much the animal consumes, thereby keeping the nutrients at appropriate levels for the desired effect. “They’ve made the product attractive, so that cattle will eat it, but only eat so much,” he explained. “Then after a while, they will come back for more. It’s an amazing level of sophistication tht has evolved with Purina’s IM Tech (Intake Modifying Technology®) program.” Boutilier says such methods of incorporating Altosid with preexisting feeding programs constitute a very cost-efficient way of controlling horn flies. Boutilier said producers should start administering the product about a month before horn flies start maturing until about 30 days after the first hard frost. That way they can virtually eliminate the horn fly season. He stressed that administering Altosid 30 days after the first frost is needed to make sure the insect doesn’t go into pupae. For more information about options for controlling horn flies through mineral supplements, contact us. This entry was posted on Saturday, March 10th, 2012 at 6:22 pm	and is filed under Cattle. You can follow any responses to this entry through the RSS 2.0 feed. Both comments and pings are currently closed.